This article is about the episodes in the Naruto: Shippuden series. For the list of episodes from the original Naruto series, see List of Naruto episodes. The cover of the first DVD compilation released by Studio Pierrot and Aniplex. Naruto: Shippuden is an anime series adapted from Part II of Masashi Kishimoto's manga series, with exactly 500 episodes. It is set two and a half years after Part I in the Naruto universe, following the ninja teenager Naruto Uzumaki and his allies. The series is directed by Hayato Date, and produced by Studio Pierrot and TV Tokyo. It began broadcasting on February 15, 2007 on TV Tokyo, and concluded on March 23, 2017. On January 2, 2009, Viz Media and Crunchyroll provided eight uncut English subtitled Naruto: Shippuden episodes on the official Naruto website. Later on January 15, Viz began providing subtitled versions of the latest Naruto: Shippuden episodes a week after they first air in Japan, with a new episode being added to the Naruto website each subsequent Thursday. The English dub of Naruto: Shippuden made its US premiere on Disney XD on October 28, 2009. On July 24, 2009, Viz Media announced that the series would be released on the iTunes Store. The first DVD release of the series in North America was released on September 29, 2009. While Naruto: Shippuden was cancelled on Disney XD on November 5, 2011 after 98 episodes, DVD box sets generally containing thirteen dubbed episodes from episode 1 onward are being released quarterly in their uncut format. The English dub was streamed on Neon Alley from its launch in October 2012 and, beginning December 29, 2012 with episode 98, new episodes were released every week uncut until September 26, 2015. Toonami began airing the series from the beginning on January 4, 2014 in an uncut format. In four regions, episodes from the series have been released on DVD and Blu-ray by single volumes and box sets. In North America, twelve single volumes and thirty eight box sets have been released. In the United Kingdom, twenty eight single volumes and six box sets have been released. In Japan, twenty six sets of volumes have been released based on which arc it represents. In Australia and New Zealand, twenty-eight collections have been released. "The Akatsuki Makes Its Move"
"The Jinchuriki of the Sand"
"Sealing Technique: Phantom Dragons Nine Consuming Seals"
"The Secret Weapon is Called...."
"Charge Tactic! Button Hook Entry!!" "Traps Activate! Team Guy's Enemy"
"Three Minutes Between Life and Death"
"Puppet Fight: 10 vs. 100!" "The Secret of the Battle!" "Infiltration: The Den of the Snake!" "The Labyrinth of Distorted Reflection"
"The Battle Over the Barrier"
"Counterattack of the Curse Mark"
"A Place to Return To"
"Guardian of the Iron Wall"
"Jugo of the North Hideout"
"Kakashi Chronicles ~ Boys' Life on the Battlefield ~ Part 1"
"Kakashi Chronicles ~ Boys' Life on the Battlefield ~ Part 2"
"Tales of a Gutsy Ninja ~Jiraiya Ninja Scroll~ Part 1"
"Tales of a Gutsy Ninja ~Jiraiya Ninja Scroll~ Part 2"
"Infiltrate! The Village Hidden in the Rain"
"The Man Who Became God"
"In Attendance, the Six Paths of Pain"
"The Tale of Jiraiya the Gallant"
"The Light & Dark of the Mangekyo Sharingan"
"Successor of the Forbidden Jutsu"
"Assault on the Leaf Village!" "Surname Is Sarutobi. Given Name, Konohamaru!" "Danger! Sage Mode Limit Reached"
"Big Adventure! The Quest for the Fourth Hokage's Legacy - Part 1"
"Big Adventure! The Quest for the Fourth Hokage's Legacy - Part 2"
"Hero of the Hidden Leaf"
"Kakashi Hatake, The Jonin in Charge"
"Inari's Courage Put to the Test"
"Ah, the Medicine of Youth"
"Gutsy Master and Student: The Training"
"Record of the Ninja Gutsy Master and Student"
"Naruto and the Old Soldier"
"Power of the Five Kage"
"The Tailed Beast vs. The Tailless Tailed Beast"
"The Five Great Nations Mobilize"
"Prophecy of the Great Lord Elder"
"The A-Rank Mission: Food Fight"
"One Worthy As A Leader"
"The Night Before the Second Exam"
"The Place Where I Belong"
"The Yamanaka Clan: Secret Ninjutsu"
"The Hidden Plot Set Into Motion"
"Hopes Entrusted to the Future"
"On the Brink of Death"
"The Formation of Team Minato"
"The Blue Beast vs. Six Paths Madara"
"The Eight Inner Gates Formation"
"The Sage of the Six Paths"
"The Ones Who Will Inherit"
"Killer Bee Rappuden Part 1"
"Killer Bee Rappuden Part 2"
"To See That Smile, Just One More Time"
"The Rules or a Comrade"
"The Darkness of the Akatsuki"
"The No. 1 Most Unpredictable Ninja"
"The Outcome of the Secret Mission"
^ NARUTO疾風伝. Media Arts Database (in Japanese). Agency for Cultural Affairs. Archived from the original on October 1, 2016. ^ "Naruto Shippūden Anime's Ending on 500th Episode Confirmed". Anime News Network. Archived from the original on March 23, 2017. ^ a b "A New Generation, A New Destiny". Viz Media. November 17, 2008. Archived from the original on December 16, 2008. ^ "Viz Confirms Plans to Present New Dubbed Naruto". Anime News Network. Archived from the original on November 14, 2016. ^ "Naruto Shippūden's Main English Dubbing Cast Announced". Anime News Network. Archived from the original on November 14, 2016. ^ "It's Official -- Naruto Shippuden to Air on Disney XD Channel". Viz Media. Archived from the original on September 15, 2009. ^ "Viz Media Brings the latest Naruto: Shippuden Story Arc to iTunes For Digital Download". Viz Media. Archived from the original on August 5, 2009. ^ a b "Naruto Shippuden, Vol. 1". Amazon.com. Archived from the original on March 7, 2016. ^ "Naruto Shippuden Disney XD schedule". toonzone.com. December 11, 2009. Archived from the original on March 19, 2012. ^ "Naruto Shippuden Box Set 9 (2012)". Amazon.com. Archived from the original on March 16, 2016. ^ "Naruto Shippuden: Set Ten (2012)". Amazon.com. Archived from the original on February 22, 2016. ^ "Toonami to Run Naruto Shippūden in January in U.S." Anime News Network. Archived from the original on February 2, 2017. ^ a b c d "Reminder: Naruto Shippūden to Debut on Disney XD Tonight". Anime News Network. 2009-10-18. Retrieved 2009-11-24. ^ a b c d e f g h i j k l m n o p q r s t u v w x y z aa ab ac ad ae af ag ah ai aj ak al am an ao ap aq ar as at au av aw ax ay az ba bb bc bd be bf bg bh bi bj bk bl bm bn bo bp bq br bs bt bu bv bw bx by bz ca cb cc cd ce cf cg ch ci cj ck cl cm cn co cp "Naruto Shippuden Disney XD schedule". toonzone.com. December 11, 2009. Archived from the original on March 19, 2012. Retrieved July 11, 2013. ^ "NARUTO－ナルト－ 疾風伝:テレビ東京". Tokyo TV. Retrieved September 7, 2010. ^ "Naruto Shippuden, Vol. 2". Viz Media. Archived from the original on February 27, 2017. ^ "Naruto: Shippuden DVD 3 (Hyb) Uncut". rightstuf.com. Archived from the original on July 26, 2009. ^ "Naruto Shippuden, Vol. 4 (DVD)". Amazon.com. Archived from the original on September 5, 2014. ^ "Naruto Shippuden, Vol. 5 (DVD)". Amazon.com. Archived from the original on February 27, 2017. ^ "Naruto Shippuden, Vol. 6 (DVD)". Amazon.com. Archived from the original on November 12, 2014. ^ "Naruto Shippuden, Vol. 7 (DVD)". Amazon.com. Archived from the original on August 25, 2016. ^ "Naruto Shippuden, Vol. 8 (DVD)". Amazon.com. Archived from the original on August 25, 2016. ^ "Naruto Shippuden, Vol. 9 (DVD)". Amazon.com. Archived from the original on August 25, 2016. ^ "Naruto Shippuden, Vol. 10 (DVD)". Viz Media. Archived from the original on July 28, 2011. ^ "Naruto Shippuden, Vol. 11 (DVD)". Barnes & Noble. Archived from the original on February 27, 2017. ^ "Naruto Shippuden, Vol. 12 (DVD)". Viz Media. Archived from the original on March 30, 2012. ^ "Naruto Shippuden, Box Set 1 (DVD)". Viz Media. Archived from the original on February 27, 2017. ^ "Naruto Shippuden, Box Set 2 (DVD)". Viz Media. Archived from the original on February 27, 2017. ^ "Naruto Shippuden Uncut, Vol. 3 (DVD Box Set)". Viz Media. Archived from the original on April 13, 2016. ^ "Naruto Shippuden Uncut, Vol. 4 (DVD Box Set)". Viz Media. Archived from the original on July 4, 2016. ^ "Naruto Shippuden Uncut, Vol. 5 (DVD Box Set)". Viz Media. Archived from the original on February 27, 2017. ^ "Naruto Shippuden Uncut, Vol. 6 (DVD Box Set)". Viz Media. Archived from the original on February 27, 2017. ^ "Naruto Shippuden Uncut, Vol. 7 (DVD Box Set)". Viz Media. Archived from the original on February 27, 2017. ^ "Naruto Shippuden Uncut, Vol. 8 (DVD Box Set)". Viz Media. Archived from the original on June 12, 2016. ^ "Naruto Shippuden Uncut, Vol. 9 (DVD Box Set)". Viz Media. Archived from the original on February 27, 2017. ^ "Naruto Shippuden Uncut, Vol. 10 (DVD Box Set)". Viz Media. Archived from the original on February 27, 2017. ^ "Naruto Shippuden Uncut, Vol 11 (DVD Box Set)". Viz Media. Archived from the original on February 27, 2017. ^ "Naruto Shippuden Uncut, Vol 12 (DVD Box Set)". Viz Media. Archived from the original on February 2, 2017. ^ "Naruto Shippuden Uncut, Vol 13 (DVD Box Set)". Viz Media. Archived from the original on June 12, 2016. ^ "Naruto Shippuden Uncut, Vol 14 (DVD Box Set)". Viz Media. Archived from the original on February 27, 2017. ^ "Naruto Shippuden Uncut, Vol 15 (DVD Box Set)". Viz Media. Archived from the original on February 27, 2017. ^ "Naruto Shippuden Uncut, Vol 16 (DVD Box Set)". Viz Media. Archived from the original on February 27, 2017. ^ "Naruto Shippuden Uncut, Vol 17 (DVD Box Set)". Viz Media. Archived from the original on February 27, 2017. ^ "Naruto Shippuden Uncut, Vol 18 (DVD Box Set)". Viz Media. Archived from the original on February 27, 2017. ^ "Naruto Shippuden Uncut, Vol 19 (DVD Box Set)". Viz Media. Archived from the original on July 1, 2016. ^ "Naruto Shippuden Uncut, Vol 20 (DVD Box Set)". Viz Media. Archived from the original on July 1, 2016. ^ "Naruto Shippuden Uncut, Vol 21 (DVD Box Set)". Viz Media. Archived from the original on July 1, 2016. ^ "Naruto Shippuden Uncut, Vol 22 (DVD Box Set)". Viz Media. Archived from the original on July 1, 2016. ^ "Naruto Shippuden Uncut, Vol 23 (DVD Box Set)". Viz Media. Archived from the original on July 1, 2016. ^ "Naruto Shippuden Uncut Set 24 (DVD)". Viz Media. Archived from the original on February 27, 2017. ^ "Naruto Shippuden Uncut Set 25 (DVD)". Viz Media. Archived from the original on June 30, 2016. ^ "Naruto Shippuden Uncut Set 26 (DVD)". Viz Media. Archived from the original on July 2, 2016. ^ "Naruto Shippuden Uncut Set 27 (DVD)". Viz Media. Archived from the original on February 27, 2017. ^ "Naruto Shippuden Uncut Set 28 (DVD)". Viz Media. Archived from the original on February 27, 2017. ^ "Naruto Shippuden Uncut Set 29 (DVD)". Viz Media. Archived from the original on February 27, 2017. ^ "Naruto Shippuden Uncut Set 30 (DVD)". Viz Media. Archived from the original on February 27, 2017. ^ "Naruto Shippuden Uncut Set 31 (DVD)". Viz Media. Archived from the original on June 1, 2017. ^ "Naruto Shippuden Uncut Set 32 (DVD)". Viz Media. Archived from the original on August 9, 2017. ^ "Naruto Shippuden, Set 33". Viz Media. Archived from the original on September 12, 2018. ^ "Naruto Shippuden, Set 34". Viz Media. Archived from the original on September 12, 2018. ^ "Naruto Shippuden, Set 35". Viz Media. Archived from the original on September 12, 2018. ^ "Naruto Shippuden Uncut Set 36 (DVD)". Amazon (company). Archived from the original on September 12, 2018. ^ "Naruto Shippuden Uncut Set 37 DVD". Amazon. Retrieved 2019-01-05. ^ "Naruto Shippuden Uncut Set 38 DVD". Amazon. Retrieved 2019-04-16. ^ "Naruto - Shippuden: Collection - Volume 1 - DVD". Xtra-vision. Archived from the original on March 1, 2017. ^ "Naruto - Shippuden: Collection - Volume 2 - DVD". Xtra-vision. Archived from the original on March 1, 2017. ^ "Naruto - Shippuden: Collection - Volume 3 - DVD". Xtra-vision. Archived from the original on March 1, 2017. ^ "Naruto - Shippuden: Collection - Volume 4 - DVD". Xtra-vision. Archived from the original on March 1, 2017. ^ "Naruto - Shippuden: Collection - Volume 5 - DVD". Xtra-vision. Archived from the original on March 1, 2017. ^ "Naruto - Shippuden: Collection - Volume 6 - DVD". Xtra-vision. Archived from the original on March 1, 2017. ^ "Naruto - Shippuden: Collection - Volume 8 - DVD". Xtra-vision. Archived from the original on March 1, 2017. ^ "Naruto - Shippuden: Collection - Volume 9 - DVD". Xtra-vision. Archived from the original on March 1, 2017. ^ "Naruto - Shippuden: Collection - Volume 10 - DVD". Xtra-vision. Archived from the original on March 1, 2017. ^ "Naruto - Shippuden: Collection - Volume 11 - DVD". Xtra-vision. Archived from the original on March 1, 2017. ^ "Naruto - Shippuden: Collection - Volume 12 - DVD". Xtra-vision. Archived from the original on March 1, 2017. ^ "Naruto - Shippuden: Collection - Volume 13 - DVD". Xtra-vision. Archived from the original on March 1, 2017. ^ "Naruto - Shippuden: Collection - Volume 14 - DVD". Xtra-vision. Archived from the original on March 1, 2017. ^ "Naruto - Shippuden: Collection - Volume 15 - DVD". Xtra-vision. Archived from the original on March 1, 2017. ^ "Naruto - Shippuden: Collection - Volume 16 - DVD". Xtra-vision. Archived from the original on March 1, 2017. ^ "Naruto - Shippuden: Collection - Volume 17 - DVD". Xtra-vision. Archived from the original on March 1, 2017. ^ "Naruto - Shippuden: Collection - Volume 18 - DVD". Xtra-vision. Archived from the original on March 1, 2017. ^ "Naruto - Shippuden: Collection - Volume 19 - DVD". Xtra-vision. Archived from the original on March 1, 2017. ^ "Naruto - Shippuden: Collection - Volume 20 - DVD". Xtra-vision. Archived from the original on March 1, 2017. ^ "Naruto - Shippuden: Collection - Volume 21 - DVD". Xtra-vision. Archived from the original on March 1, 2017. ^ "Naruto - Shippuden: Collection - Volume 22 - DVD". Xtra-vision. Archived from the original on March 1, 2017. ^ "Naruto - Shippuden: Collection - Volume 23 - DVD". Xtra-vision. Archived from the original on March 1, 2017. ^ "Naruto - Shippuden: Collection - Volume 24 - DVD". Xtra-vision. Archived from the original on March 1, 2017. ^ "Naruto - Shippuden: Collection - Volume 25 - DVD". Xtra-vision. Archived from the original on March 1, 2017. ^ "Naruto - Shippuden: Collection - Volume 26 - DVD". Xtra-vision. Archived from the original on March 1, 2017. ^ "Naruto - Shippuden: Collection - Volume 27 - DVD". Xtra-vision. Archived from the original on March 1, 2017. ^ "Naruto - Shippuden: Collection - Volume 28 - DVD". Xtra-vision. Archived from the original on March 1, 2017. ^ "Naruto - Shippuden: Collection - Volume 29 - DVD". Xtra-vision. Archived from the original on 2018-02-09. ^ "Naruto Shippuden Box 30". Amazon. Retrieved November 27, 2017. ^ "Naruto Shippuden Box 31". Amazon. Retrieved February 26, 2018. ^ "Naruto Shippuden Box 32". Amazon. Retrieved May 21, 2018. ^ "Naruto Shippuden Box 33". Amazon. Retrieved August 20, 2018. ^ "Naruto Shippuden Box 34". Amazon. November 19, 2018. ^ "Naruto Shippuden Box Set 35". Amazon. Retrieved February 11, 2019. ^ "Naruto Shippuden Box Set 36". Amazon. Retrieved March 20, 2019. ^ "Naruto Shippuden - Series 1 [DVD] ". Amazon.com. ^ "Naruto Shippuden - Series 2 [DVD]". Amazon.com. Archived from the original on March 1, 2017. ^ "Naruto Shippuden Complete Series 3 Box Set (Episodes 101-153) [DVD]". Amazon.com. Archived from the original on March 1, 2017. ^ "Naruto - Shippuden: Complete Series 4 [DVD]". Amazon.com. Archived from the original on March 1, 2017. ^ "Naruto Shippuden Complete Series 5 Box Set (Episodes 193-244) [DVD]". Amazon.com. Archived from the original on March 1, 2017. ^ "Naruto Shippuden Complete Series 9 (ep 402-458)". Amazon.com. ^ "Naruto: Shippuden DVD Series One title" (in Japanese). Play-Asia. Archived from the original on June 15, 2011. ^ a b c d e f g h "風影奪還の章 - TV DVD - NARUTO-ナルト- 疾風伝 - アニプレックス" (in Japanese). Aniplex. Archived from the original on August 8, 2016. ^ "Naruto: Shippuden DVD Series Two title" (in Japanese). Play-Asia. Archived from the original on June 15, 2011. ^ a b c d e "遥かなる再会の章 - TV DVD - NARUTO-ナルト- 疾風伝 - アニプレックス" (in Japanese). Aniplex. Archived from the original on August 12, 2016. ^ "Naruto: Shippuden DVD Series Three title" (in Japanese). Aniplex. Archived from the original on September 18, 2008. ^ a b c d "守護忍十二士の章 - TV DVD - NARUTO-ナルト- 疾風伝 - アニプレックス" (in Japanese). Aniplex. Archived from the original on August 2, 2016. ^ "Naruto: Shippuden DVD Series Four title" (in Japanese). Neowing. Archived from the original on October 15, 2008. ^ a b c d "不死の破壊者、飛段・角都の章 - TV DVD - NARUTO-ナルト- 疾風伝 - アニプレックス" (in Japanese). Aniplex. Archived from the original on August 12, 2016. ^ "Naruto: Shippuden DVD Series Five title" (in Japanese). Amazon.com. Archived from the original on July 9, 2009. ^ a b c d e f "三尾出現の章 - TV DVD - NARUTO-ナルト- 疾風伝 - アニプレックス" (in Japanese). Aniplex. Archived from the original on July 13, 2016. ^ "Naruto: Shippuden DVD title" (in Japanese). Neowing. Archived from the original on May 11, 2011. ^ "Naruto: Shippuden DVD title" (in Japanese). Amazon.com. Archived from the original on June 17, 2010. ^ a b c d e f g "師の予言と復讐の章 - TV DVD - NARUTO-ナルト- 疾風伝 - アニプレックス" (in Japanese). Aniplex. Archived from the original on July 12, 2016. ^ "Naruto: Shippuden DVD Series Seven title" (in Japanese). Amazon.com. Archived from the original on November 19, 2010. ^ a b "Naruto: Shippuden Season Seven DVDs". Amazon.com. Archived from the original on November 19, 2010. ^ a b "六尾発動の章 - TV DVD - NARUTO-ナルト- 疾風伝 - アニプレックス" (in Japanese). Aniplex. Archived from the original on July 13, 2016. ^ "Naruto: Shippuden DVD Series Eight title" (in Japanese). Animateworks. Archived from the original on January 19, 2016. ^ a b c d e f "二人の救世主の章 - TV DVD - NARUTO-ナルト- 疾風伝 - アニプレックス" (in Japanese). Aniplex. Archived from the original on July 13, 2016. ^ "Naruto: Shippuden DVD Series Nine title" (in Japanese). Neowing. Archived from the original on May 11, 2011. ^ a b c d e "過去篇～木ノ葉の軌跡～ - TV DVD - NARUTO-ナルト- 疾風伝 - アニプレックス" (in Japanese). Aniplex. Archived from the original on July 13, 2016. ^ a b c d e f "五影集結の章 - TV DVD - NARUTO-ナルト- 疾風伝 - アニプレックス" (in Japanese). Aniplex. Archived from the original on July 13, 2016. ^ a b c d e "船上のパラダイスライフ - TV DVD - NARUTO-ナルト- 疾風伝 - アニプレックス" (in Japanese). Aniplex. Archived from the original on July 13, 2016. ^ a b "スペシャル版 - TV DVD - NARUTO-ナルト- 疾風伝 - アニプレックス" (in Japanese). Aniplex. Archived from the original on March 2, 2017. ^ a b c d e f "九尾掌握と因果なる邂逅の章 - TV DVD - NARUTO-ナルト- 疾風伝 - アニプレックス" (in Japanese). Aniplex. Archived from the original on July 13, 2016. ^ a b c "九尾掌握と因果なる邂逅の章 - TV DVD - NARUTO-ナルト- 疾風伝 - アニプレックス" (in Japanese). Aniplex. Archived from the original on July 13, 2016. ^ a b "スペシャル版 - TV DVD - NARUTO-ナルト- 疾風伝 - アニプレックス" (in Japanese). Aniplex. Archived from the original on July 4, 2016. ^ a b c d e f g "忍界大戦・サスケとイタチ - TV DVD - NARUTO-ナルト- 疾風伝 - アニプレックス" (in Japanese). Aniplex. Archived from the original on July 12, 2016. ^ a b c "カカシ暗部篇 ～闇を生きる忍～ - TV DVD - NARUTO-ナルト- 疾風伝 - アニプレックス" (in Japanese). Aniplex. Archived from the original on July 13, 2016. ^ a b c "忍界大戦・第七班再び - TV DVD - NARUTO-ナルト- 疾風伝 - アニプレックス" (in Japanese). Aniplex. Archived from the original on August 5, 2016. ^ a b c d e "忍界大戦・うちはオビト - TV DVD - NARUTO-ナルト- 疾風伝 - アニプレックス" (in Japanese). Aniplex. Archived from the original on August 12, 2016. ^ "NARUTO -ナルト- 疾風伝 ナルトの背中～仲間の軌跡～ 1 アニメ DVD" (in Japanese). Neowing. Archived from the original on March 2, 2017. ^ "NARUTO -ナルト- 疾風伝 ナルトの背中～仲間の軌跡～ 2 アニメ DVD" (in Japanese). Neowing. Archived from the original on March 2, 2017. ^ "NARUTO -ナルト- 疾風伝 ナルトの背中～仲間の軌跡～ 3 アニメ DVD" (in Japanese). Neowing. Archived from the original on March 2, 2017. ^ "NARUTO -ナルト- 疾風伝 ナルトの背中～仲間の軌跡～ 4 アニメ DVD" (in Japanese). Neowing. Archived from the original on March 2, 2017. ^ "NARUTO -ナルト- 疾風伝 ナルトの背中～仲間の軌跡～ 5 アニメ DVD" (in Japanese). Neowing. Archived from the original on March 2, 2017. ^ "NARUTO-ナルト- 疾風伝 無限月読・発動の章 1 アニメ DVD" (in Japanese). Neowing. Archived from the original on March 2, 2017. ^ "NARUTO-ナルト- 疾風伝 無限月読・発動の章 2 アニメ DVD" (in Japanese). Neowing. Archived from the original on March 2, 2017. ^ "NARUTO-ナルト- 疾風伝 無限月読・発動の章 3 アニメ DVD" (in Japanese). Neowing. Archived from the original on March 2, 2017. ^ "NARUTO-ナルト- 疾風伝 無限月読・発動の章 4 アニメ DVD" (in Japanese). Neowing. Archived from the original on February 25, 2016. ^ "NARUTO-ナルト- 疾風伝 自来也忍法帳～ナルト豪傑物語～ 1 アニメ DVD" (in Japanese). Neowing. Archived from the original on March 2, 2017. ^ "NARUTO-ナルト- 疾風伝 自来也忍法帳～ナルト豪傑物語～ 2 アニメ DVD" (in Japanese). Neowing. Archived from the original on March 2, 2017. ^ "NARUTO-ナルト- 疾風伝 自来也忍法帳～ナルト豪傑物語～ 3 アニメ DVD" (in Japanese). Neowing. Archived from the original on March 2, 2017. ^ "NARUTO-ナルト- 疾風伝 自来也忍法帳～ナルト豪傑物語～ 4 アニメ DVD" (in Japanese). Neowing. Archived from the original on March 2, 2017. ^ "NARUTO-ナルト- 疾風伝 自来也忍法帳～ナルト豪傑物語～ アニメ DVD" (in Japanese). Neowing. Archived from the original on March 2, 2017. ^ "NARUTO-ナルト- 疾風伝 イタチ真伝篇～光と闇～ 1 アニメ DVD" (in Japanese). Neowing. Archived from the original on March 2, 2017. ^ "NARUTO-ナルト- 疾風伝 イタチ真伝篇～光と闇～ 2 アニメ DVD" (in Japanese). Neowing. Archived from the original on March 2, 2017. ^ "NARUTO-ナルト- 疾風伝 忍宗の起源 ～二つの魂インドラ・アシュラ～ 1 アニメ DVD" (in Japanese). Neowing. Archived from the original on March 17, 2017. ^ "NARUTO-ナルト- 疾風伝 忍宗の起源 ～二つの魂インドラ・アシュラ～ 2 アニメ DVD" (in Japanese). Neowing. Archived from the original on June 19, 2017. ^ "NARUTO-ナルト- 疾風伝 忍宗の起源 ～二つの魂インドラ・アシュラ～ 3 アニメ DVD" (in Japanese). Neowing. Archived from the original on June 19, 2017. ^ "NARUTO-ナルト- 疾風伝 ナルトとサスケの章 1 アニメ DVD" (in Japanese). Neowing. Archived from the original on June 19, 2017. ^ "NARUTO-ナルト- 疾風伝 ナルトとサスケの章 2 アニメ DVD" (in Japanese). Neowing. Archived from the original on June 19, 2017. ^ "NARUTO-ナルト- 疾風伝 ナルトとサスケの章 3 アニメ DVD" (in Japanese). Neowing. Archived from the original on June 19, 2017. ^ "NARUTO―ナルト― 疾風伝 Nostalgic Days アニメ DVD" (in Japanese). Neowing. Archived from the original on June 19, 2017. ^ "NARUTO-ナルト- 疾風伝 サスケ真伝 来光篇 DVD" (in Japanese). Neowing. ^ "NARUTO-ナルト- 疾風伝 シカマル秘伝 闇の黙に浮ぶ雲 DVD" (in Japanese). Neowing. ^ "NARUTO-ナルト- 疾風伝 木ノ葉秘伝 祝言日和 1" (in Japanese). Neowing. June 24, 2017. ^ "NARUTO-ナルト- 疾風伝 木ノ葉秘伝 祝言日和 2" (in Japanese). Neowing. July 28, 2017. ^ "Naruto Shippuden Collection (Eps 1-13)". Madman Entertainment. Archived from the original on January 19, 2016. ^ "Naruto Shippuden Collection (Eps 14-26)". Madman Entertainment. Archived from the original on January 19, 2016. ^ "Naruto Shippuden Collection (Eps 27-39)". Madman Entertainment. Archived from the original on January 19, 2016. ^ "Naruto Shippuden Collection 04 (Eps 40-52) - DVD". Madman Entertainment. Archived from the original on March 22, 2016. ^ "Naruto Shippuden Collection 05 (Eps 53-65) - DVD". Madman Entertainment. Archived from the original on January 7, 2016. ^ "Naruto Shippuden Collection 06 (Eps 66-77) - DVD". Madman Entertainment. Archived from the original on March 22, 2016. ^ "Naruto Shippuden Collection 07 (Eps 78-88) - DVD". Madman Entertainment. Archived from the original on March 23, 2016. ^ "Naruto Shippuden Collection 08 (Eps 89-100) - DVD". Madman Entertainment. Archived from the original on March 22, 2016. ^ "Naruto Shippuden Collection 09 (Eps 101-112) - DVD". Madman Entertainment. Archived from the original on April 21, 2016. ^ "Naruto Shippuden Collection 10 (Eps 113-126) - DVD". Madman Entertainment. Archived from the original on March 15, 2016. ^ "Naruto Shippuden Collection 11 (Eps 127-140) - DVD". Madman Entertainment. Archived from the original on April 21, 2016. ^ "Naruto Shippuden Collection 12 (Eps 141-153) - DVD". Madman Entertainment. Archived from the original on April 21, 2016. ^ "Naruto Shippuden Collection 13 (Eps 154-166) - DVD". Madman Entertainment. Archived from the original on August 8, 2014. ^ "Naruto Shippuden Collection 14 (Eps 167-179) - DVD". Madman Entertainment. Archived from the original on August 8, 2014. ^ "Naruto Shippuden Collection 15 (Eps 180-192) - DVD". Madman Entertainment. Archived from the original on August 8, 2014. ^ "Naruto Shippuden Collection 16 (Eps 193-205) - DVD". Madman Entertainment. Archived from the original on September 14, 2016. ^ "Naruto Shippuden Collection 17 (Eps 206-218) - DVD". Madman Entertainment. Archived from the original on September 22, 2016. ^ "Naruto Shippuden Collection 18 (Eps 219-231) - DVD". Madman Entertainment. Archived from the original on August 10, 2016. ^ "Naruto Shippuden Collection 19 (Eps 232-244) - DVD". Madman Entertainment. Archived from the original on October 21, 2016. ^ "Naruto Shippuden Collection 20 (Eps 245-257) - DVD". Madman Entertainment. Archived from the original on September 22, 2016. ^ "Naruto Shippuden Collection 21 (Eps 258-270) - DVD". Madman Entertainment. Archived from the original on September 22, 2016. ^ "Naruto Shippuden Collection 22 (Eps 271-283) - DVD". Madman Entertainment. Archived from the original on March 2, 2017. ^ "Naruto Shippuden Collection 23 (Eps 284-296) - DVD". Madman Entertainment. Archived from the original on January 2, 2017. ^ "Naruto Shippuden Collection 24 (Eps 297-309) - DVD". Madman Entertainment. Archived from the original on September 22, 2016. ^ "Naruto Shippuden Collection 25 (Eps 310-322) - DVD". Madman Entertainment. Archived from the original on April 5, 2016. ^ "Naruto Shippuden Collection 26 (Eps 323-335) - DVD". Madman Entertainment. Archived from the original on December 20, 2016. ^ "Naruto Shippuden Collection 27 (Eps 336-348) - DVD". Madman Entertainment. Archived from the original on March 2, 2017. ^ "Naruto Shippuden Collection 28 (Eps 349-361) - DVD". Madman Entertainment. Archived from the original on March 2, 2017. ^ "Naruto Shippuden Collection 29 (Eps 362-374) - DVD". Madman Entertainment. Archived from the original on June 19, 2017. ^ "Naruto Shippuden Collection 30 (Eps 375-387) - DVD". Madman Entertainment. Archived from the original on June 19, 2017. ^ "Naruto Shippuden Collection 31 (Eps 388-401) - DVD". Madman Entertainment. ^ "Naruto Shippuden Hokage Box 1 (Eps 1-100) - DVD". Madman Entertainment. Archived from the original on June 21, 2017. ^ "Naruto Shippuden Hokage Box 2 (Eps 101-205) - DVD". Madman Entertainment. Archived from the original on June 21, 2017. "Naruto: Shippuden episodes from 2007" (in Japanese). TV Tokyo. Archived from the original on December 16, 2009. "Naruto: Shippuden episodes from 2008" (in Japanese). TV Tokyo. Archived from the original on December 31, 2009. "Naruto: Shippuden episodes from 2009" (in Japanese). TV Tokyo. Archived from the original on December 31, 2010. "Naruto: Shippuden episodes from 2010" (in Japanese). TV Tokyo. Archived from the original on December 31, 2010. 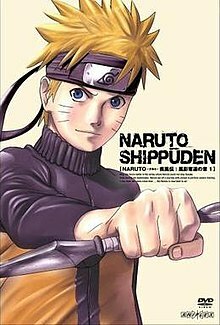 "Naruto: Shippuden episodes from 2011" (in Japanese). TV Tokyo. Archived from the original on April 19, 2007. NARUTO疾風伝. Media Arts Database (in Japanese). Agency for Cultural Affairs. Archived from the original on October 1, 2016. "List of Naruto: Shippuden episode titles". Archived from the original on December 19, 2009. "Naruto: Shippuden". Toonzone. Archived from the original on March 19, 2012.